We’ve been through many scenarios. 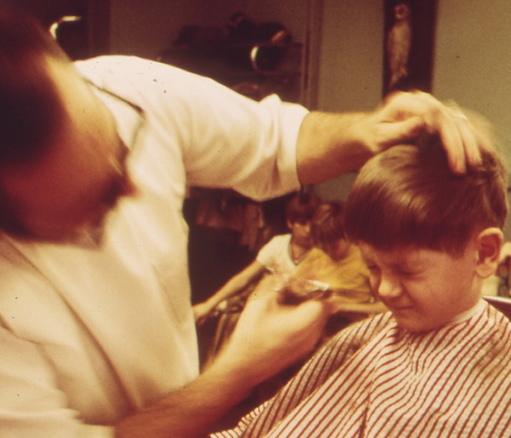 When Clay was younger, and a little more prone to sit still, we would brave the local barbershop. While his behind would stay planted in the chair, his head would bob and weave like a prize fighter. I’m sure some of the barbers took extra long with the person they were working on when it was clear that Clay’s turn was next, hoping they didn’t draw that number. We finally gave that up after a few years when one unlucky soul managed to cut his own finger during the mayhem. Next up, we tried the hairdresser that both my wife and I had been using for years. At that point, we couldn’t even get Clay into the chair, so this high-energy man agreed to cut his hair in the studio bathroom. That worked for maybe a year before we just didn’t have the heart or energy to put on our private circus act for the foil-headed ladies. So, armed with some tips from that hairdresser, some cheap clippers, a pair of scissors and the steely determination of Joan of Arc, we have been tag teaming Clay once a month for the past few years. After some poorly thought-out initial efforts, we have settled into a steady routine. We block him in the downstairs bathroom. (It’s roomier than the one upstairs, but still limits his space for wandering.) Then we alternate between my wife and the scissors and me and the clippers until we have tamed the wild jungle on his head. Clay’s part in this is to keep moving. No sitting in a chair for the little guy. He is in motion, a caged hamster darting from one corner to another. If we move toward his head, he leans away. If we try to cut his right side, he turns to the left. Inevitably, he winds up with bald patches on the side of his head, crooked bangs, lopsided sideburns and two sweaty, exhausted parents. But as long as he still has both ears and we can count 30 fingers among the three of us, we consider it a victory. “Why don’t you like haircuts?” my wife typed. The clippers seem to be a particular nemesis. Not much positive to run with there. Of course, now that he is approaching 16 in a few months, it doesn’t end with a haircut. Once a week, Clay gets a shave, an operation in the shower that takes a steady hand and lightning-fast reflexes combined with the balance of an acrobat to stay upright on the wet floor. I have none of those skills. But that is what makes it so much fun. This entry was posted on May 17, 2011, 9:53 am and is filed under Daily Life, Silly Behaviors. You can follow any responses to this entry through RSS 2.0. You can leave a response, or trackback from your own site. Thanks for the advice, Chris. We’ve tried some of that, and it helps a bit. The tough part is just keeping him still, and we haven’t found an answer to that one, yet. Thanks, everyone, for your thoughts and suggestions. Much appreciated. The adventure continues.